The new Autumn/Winter mini-catalogue went live recently. It is packed with lots of lovely goodies for Halloween and Christmas. My favourite stamp set is Lighthearted Leaves which I think is just beautiful. It has an ethnic feel which I love and has not only 6 leaf stamps, but 4 sentiments which is fabulous value. This a simple card made with a Crumb Cake card blank. I decided not to mat and to let the leaves speak for themselves. First I stamped the leaves with Versamark and then using a gold embossing powder, I heat embossed them. I still love to watch the powder change colour. How sad is that? I ran the stamped impressions through the Big Shot with the co-ordinating framelts. Then using two ink colours, Old Olive and Melon Mambo on a sponge, I rubbed ink over the leaves until I was happy with them. A tip here is not to overload the sponge. You can add more ink, but not take it away. Not only do you end up with a pretty image, but the gold embossing powder buffs up beautifully. 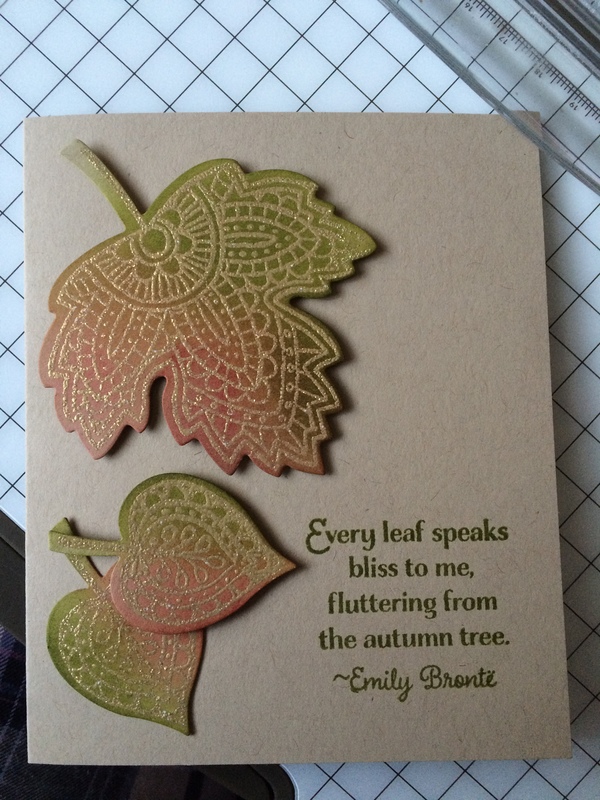 Before placing the leaves on the card, I stamped my favourite sentiment from the set, a quote from Emily Bronte, directly on to the face of the card and then using a combination of mini glue dots and dimensionals placed the leaves. This is a gorgeous fall card. Reminiscent of crisp mornings.